which was the house of the Ottoman Sultans for more than 400 years, witnessed innumerable lavish events, ceremonies and celebrations. The Holy month of Ramadan was certainly one of those spectacular celebrations enjoyed by those living within the walls of this marvelous castle. Those who lived in the palace enjoyed gatherings filled with entertainment and spirituality and savoured a diversity of flavours – of course fit for royals. 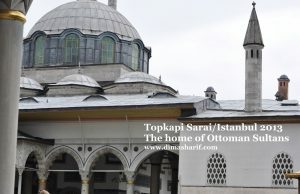 Other than the daily celebrations and the lavish food, Topkapi Sarai saw many ceremonies during Ramadan such as the opening of the Hirka-i Serif (the Holy mantle that belonged to prophet Muhammad) and the Baklava Parade of the janissaries (described this link) as well as the ceremonies of the Sultans breaking fast with the attendants of Enderun (the palace’s school) and the general public, and as with everything done at the palace, all will be held in accordance with the palace’s rituals. On a more personal level, the Ottoman Sultans were also romantic people. Despite all the ceremonies and obligations, they dedicated days for breaking fast with their wives and would even go the length of having specific areas constructed especially for breaking the fast with their loved ones. For instance, Sultan Ibrahim i, ordered the construction of an alcove in the palace’s garden so that he could privately breakfast with his wife enjoying the scenery of a nearby park. As well as being a royal residence, the palace was a setting for state occasions and royal entertainments. At its peak, the palace housed over 4000 people. The palace included mosques, Enderun (school), hospital and bakeries… and among its facilities was the Imperial Harem, which was the house of Valide Sultan (the ruling sultan’s mother), concubines, wives and children of the sultan and all their servants. Most fascinating though of all the facilities are the palace Kitchens. The elongated palace kitchens are a prominent feature of the palace. While some of the kitchens were first built in the 15th century at the time when the palace was constructed, they were enlarged during the reign of Sultan Suleiman the Magnificent. Then the kitchens have been rebuilt to the old plan after having burnt down. 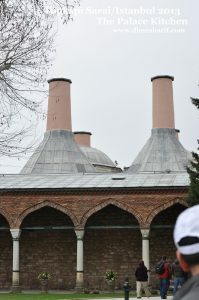 The palace kitchens consist of 10 domed buildings, forming two rows of 20 wide chimneys, rising like stacks from a ship from domes on octagonal drums. Marvelous in their functionality, they were the largest kitchens in the Ottoman Empire. These buildings include: the Imperial Kitchen (for the Sultan and his guests), Enderûn Kitchen (for palace school), Harem Kitchen (for women’s quarters), Birûn (outer service section of the palace), beverages kitchen, confectionery kitchen, creamery, storerooms and rooms for the cooks. While at first this sounds oddly huge, after consideration and taking into account that the meals for the Sultan and guests (when present), the residents of the Harem, Enderûn and Birûn (the inner and outer services of the palace) were prepared in these buildings, also considering the number of people to feed was a minimum of 4,000 people at any given day, makes this enormity a little easier to understand. The kitchen staff alone consisted of more than 800 people, rising to 1,000 on religious holidays such as Ramadan. Apart from exhibiting Kitchen utensils, today the buildings contain a silver gifts and utensils collection, as well as large collections of Chinese blue & white, white and celadon porcelain. generally pastry-oriented, the most traditional Ramadan dessert being Güllaç (made by layers of thin cornstarch pastry soaked in rosewater-infused milk). As with all else, even the serving of food to the sultan was strictly regulated by protocol. During Ramadan, both Enderun and the harem would take their Iftars and Suhours as well as perform the Tarawih prayer with the sultan. At Iftar, starters will be served and after consuming these Iftar starters, the evening prayer would be performed. Once done with the prayer, the main meal will be served. When the main dishes were consumed, there would be table talk before desserts were served by order of the sultan. These intervals between courses were intended to prevent potential indigestion. In her memoirs, Lady Mary Wortley Montagu (an English aristocrat who visited Istanbul in the early 1700s) noted that at the palace, there would be two performances each day of the Tarawih prayer. Young girls would attend a quick Tarawih prayer session at the harem, while the older ladies would opt for a session that was slower and longer. The sultan and students of Enderun would also attend this second session, during which the Quran would be recited in length, aiming to read the Quran in full within the month. This way of performing the prayer came to be known as the Enderun-style Tarawih prayer, and has recently returned to public appeal in Turkey. Evenings at the palace would see lessons specific to Ramadan taught in the royal presence with the attendance of the students of Enderun. During these lessons, senior clerics would discuss religious matters. 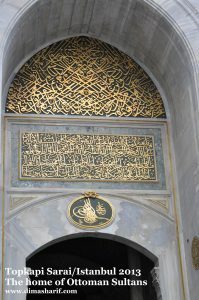 In his writings, the investigative author Talha Uğurluel argues that this program, held in the Royal Room, was intended to “teach the sultan some lessons under the pretext of Ramadan”. Another custom that takes place at the palace during the exhibition of the Hırka-i Şerif, held on the 15th day of Ramadan, is the Baklava Parade. On the day, trays of baklava would be distributed to the janissaries, who then – in troops – would carry these trays to their barracks (red more about Baklava Parade and the recipe on the link below). It must have been wonderful living at those times! Wouldn’t it be nice to have access to experiencing moments in history? Well the closest you can get is by visiting Topkapi and really imagining how life was. The museum over there makes it even more visual giving you a glimpse of that space and time. Watching the Drama (Hareem Al Sultan) too gives you a sense of the era, however do keep in mind that it is not entirely accurate and it is more a TV Drama than a historical record. 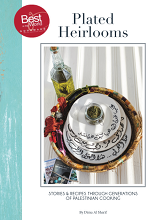 I hope that you have enjoyed my posts and recipes of ‘Ramadan in Ottoman Times’, I would love to hear your thoughts so do leave a comment before you go and tell me what you think.